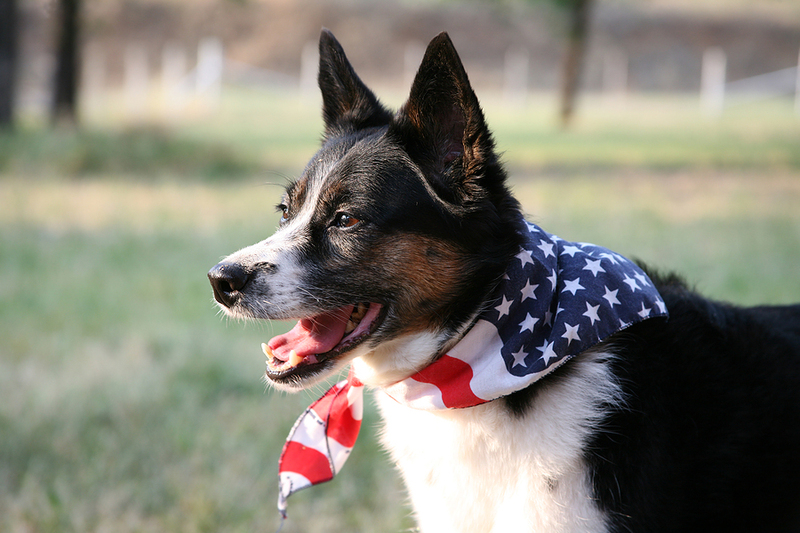 While we may love the 4th of July and all the pomp and circumstance – it may be a very different story for our four legged and feathered friends. Sudden loud fireworks going off nearby, loud parties, or just having more friends and family over can very easily stress out your otherwise well behaved pets. To enjoy the 4th, here are some simple tips to help your pet and family make it through the weekend! Make sure you have a collar with ID tags on your pets at all times during this weekend. Some owners like to take their pet’s flat collar off when they are in the house – but the first block buster that goes off could scare your pet so much they may bolt out your front door and take off. Leave your pets home in a secured house. Pets do not need to be at firework shows, it’s almost inhumane if you are not sure of how your dog may react. Know your dog, some dogs don’t seem to mind, but think about their sensitive hearing. Having a 4th BBQ? Friends and family tend to want to feed your dog or cat while at a party, to avoid this ask them not to or have your pet in a safe cool room away from all the guests. Check on the pet often, make sure he has fresh water and a comfy place to sleep away from the crowd. (Lock the door if you can!) Guests that are not pet savvy could accidentally open or leave the door open and the pet could escape. Parades and pets. Some dogs, horses, and yes even cats are fine while attending a parade with you. Again, know your pet – if you see the animal shaking, panting, drooling, pulling on the leash – those are all signs of stress. Some pets do not do well in large crowds, people, kids petting poking at them, loud sirens from fire trucks going by, etc. If you see your dog is stressed – leave the parade – don’t comfort the dog with, “It’s ok” while petting the panicked animal – that will just make it worse. Bringing your dog out on your boat or too the beach? Bring plenty of cold bottled water, pet safe bug spray and sunscreen, extra leash and collar with ID, treats, doggie life jacket, and monitor them for overheating, bug bites, ticks and make sure their paws are not on hot surfaces for a long time -concrete and sand can be scorching- and of course bring poop pick up bags! Traveling for the 4th and bringing your pet? Find out where the nearest 24hour emergency clinic is at your destination. Make sure there are no Breed Restrictions at your location. While en route use a safety harness that clips into the seatbelt of your car, or crate your pet while traveling. Have a first aid kit in your car especially for pets and bring extra pet food and water – you never know if your car breaks down you get stuck somewhere.